Henry Augustus Rowland (November 27, 1848 – April 16, 1901) was an American physicist. Between 1899 and 1901 he served as the first president of the American Physical Society. He is remembered today particularly for the high quality of the diffraction gratings he made and for the work he did with them on the solar spectrum. Rowland (born 1848, died 1901) was born in Honesdale, Pennsylvania, where his father Henry Augustus Rowland was the Presbyterian pastor of a local church. From an early age he exhibited marked scientific tastes and spent all his spare time in electrical and chemical experiments. At the Rensselaer Polytechnic Institute at Troy, N.Y. he graduated in 1870, and he then obtained an engagement on the Western New York railway. But the work there was not to his liking, and after a short time he gave it up for an instructorship in natural science at the University of Wooster, Ohio, which in turn he resigned in order to return to Troy as assistant professor of physics. Finally, in 1876, he became the first occupant of the chair of physics at the Johns Hopkins University, Baltimore, a position which he retained until his premature death on April 16, 1901. Rowland was one of the most brilliant American scientists of his day, and it is curious that at first his merits were not perceived in his own country. He was unable to secure the publication of many of his early scientific papers; but James Clerk Maxwell at once saw their excellence, and had them printed in the Philosophical Magazine. When the managers of the Johns Hopkins University asked advice in Europe as to whom they should make their professor of physics, he was pointed out in all quarters as the best man for the post. In the interval between his election and the assumption of his duties at Baltimore, he studied physics under Hermann von Helmholtz in his laboratary in Berlin (1875–6), and carried out a well-known research on the effect of an electrically charged body in motion, showing it to give rise to a magnetic field. As soon as he was settled at Baltimore, two important pieces of work engaged his attention. One was a redetermination of the ohm. For this he obtained a value which was substantially different from that ascertained by the committee of the British Association appointed for the purpose, but ultimately he had the satisfaction of seeing his own result accepted as the more correct of the two. The other was a new determination of the mechanical equivalent of heat. In this he used J. P. Joule's paddle-wheel method, though with many improvements, the whole apparatus being on a larger scale and the experiments being conducted over a wider range of temperature. He obtained a result distinctly higher than Joule's final figure; and in addition he made many valuable observations on the thermodynamics involved, and on the variation of the specific heat of water, which Joule had assumed to be the same at all temperatures. In 1882, before the Physical Society of London, he gave a description of the diffraction gratings, with which his name is specially associated, and which have been of enormous advantage to astronomical spectroscopy. These gratings consist of pieces of metal or glass ruled by means of a diamond point with a very large number of parallel lines, on the extreme accuracy of which their efficiency depends. 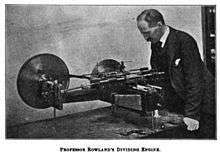 For their production, therefore, dividing engines of extraordinary trueness and delicacy were required, and in the construction of such machines Rowland's engineering skill brought him conspicuous success. The results of his labors may be found in the elaborate Photographic Map of the Normal Solar Spectrum (1888) and the Table of Solar Wave-Lengths (1898). In the later years of his life he was engaged in developing a system of multiplex telegraphy. He authored A Plea for Pure Science, in 1883 an important document for the understanding of the relationship between science in university and in commercial contexts in the late nineteenth and early twentieth century. The National Academy of Sciences awarded Rowland the Henry Draper Medal in 1890 for his contributions to astrophysics. He won the Matteucci Medal in 1895. The Henry August Rowland House in Baltimore was designated a U.S. National Historic Landmark. ↑ Wilson, James Grant; Fiske, John, eds. (1900). "Rowland, Henry Augustus". Appletons' Cyclopædia of American Biography. New York: D. Appleton. ↑ David Cahan, M. Eugene Rudd, Science at the American Frontier: A Biography of DeWitt Bristol Brace, University of Nebraska Press, 2000, p. 22; Jed Z. Buchwald, The Creation of Scientific Effects: Heinrich Hertz and Electric Waves, University of Chicago Press, 1994, p. 354; David Cahan, Hermann von Helmholtz and the Foundations of Nineteenth-century Science, University of California Press, 1993, p, 397. 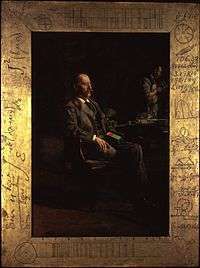 ↑ He was so closely associated with diffraction gratings that his 1897 portrait by Thomas Eakins shows him holding one in his hand. ↑ "Henry Draper Medal". National Academy of Sciences. Retrieved 19 February 2011. This article incorporates text from a publication now in the public domain: Chisholm, Hugh, ed. (1911). "Rowland, Henry Augustus". Encyclopædia Britannica (11th ed.). Cambridge University Press.